Oluwafemi Salami, foundly called Master Excel decided to take his future in his hands upon graduation and therefore, launched out into business. He tried and failed in a venture; but refused to give up. Thus, after making some inquiries about poultry farm, he decided to get started on it since, it’s an industry he is passionate about. 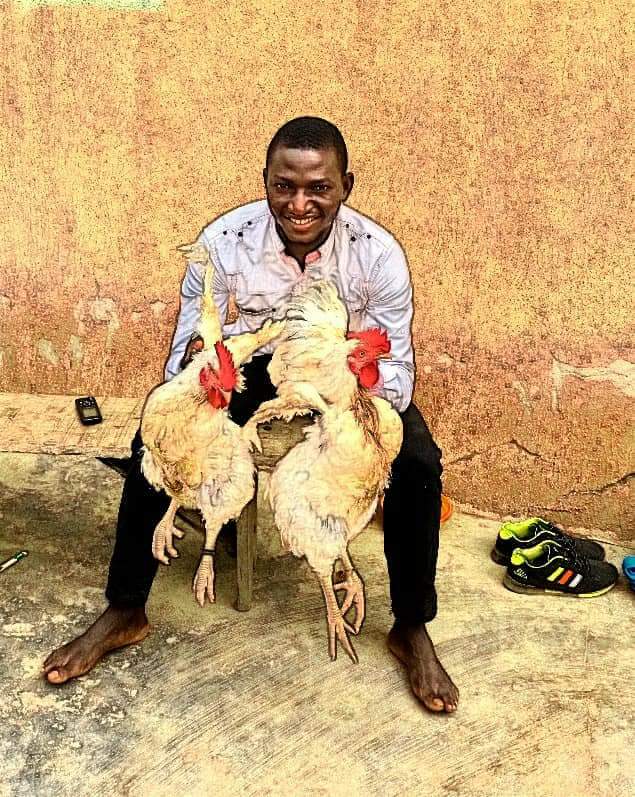 This biochemist turned farmer started with a 2-step cage in his father’s compound, sometimes lost his birds; but persisted. He picked the lessons from his failures, ploughed back into his business to build a 700 capacity bird farm which he sells off every two months and has empowered over 932 African youths to launch their agribusiness. He took a break from his busy schedule running SAILTHROUGH FARMS LIMITED to tell BROJID WORLD’S Chief Content Officer, JOSEPH DIWNOKE his story. I am sure you will be inspired reading it. You will glean lessons on raising capital for your business, handling failures perseverance and business growth. My name is Oluwafemi Salami. I am fondly called Master Excel on my social media platforms. I am the founder and CEO of SailThrough Farms Limited. SailThrough Farms is into livestock farming (specifically poultry), manufacturing of poultry feeds, commodity trading, and other agro allied products and services. We also are into Consultancy which is both online and face to face including setting up farms and sales of agriculture/agribusiness related ebooks. I am also the initiator and founder of the Millionaires in Agribusiness Revolutionary Movement (aka MIA). An online based telegram community that is focused on raising giants in the agro sector by changing the wrong perception people have of farmers, educating and empowering farmers to not just feed the Nations but also build an empire around their agribusiness. Why did you choose agro business instead of working in a pharm firm with your biochemistry degree? First, let me quickly state that I am also a Civil servant. I work with FCT UBEB but my agribusiness venture started long before the job came. So it should be clear that I have a federal job but that it is not because my agribusiness couldn’t foot my bills that I had to get a job. In fact my getting that federal job is because of a special interest. I started out in agribusiness because of a lot of reasons. One is that growing up I saw how farmers were looked down on and called all sort of belittling names – dirty, poor and so on. So I thought: how can people who are feeding others be poor? We have a larger population with these wrong perceptions about farmers such that it becomes very difficult for youths to even have the slightest thought of being farmers. I know deep down that these perceptions were not true because I have relatives who built houses and lead good lives doing nothing but farming. So this was my first inspiration. I wanted to change the trend. I see agriculture as a business but far beyond this, I believe anyone from any field can fit into at least one niche in the agro sector. May be not directly but I have seen Lawyers, Engineers, Biochemist…. making tremendous impacts in this field. There are just so much opportunities and Nigeria is lucky to have all that it takes in terms of man power, arable lands and other natural resources. Then the third reason is that the world is faced with a serious threat of hunger. By 2035 Africa’s population is estimated to be 1 billion and the world’s 10 billion by 2050. Unless we start getting serious with farming, many nations will face hunger. Here in Nigeria, we have the agro sector mainly populated by the old. We need the youths in this sector. We can achieve more with the youths. The youths are creative, innovative and energetic. So the above are the major reasons why I joined the agribusiness. If I can get just 10% of the youths to see what I saw and still see in this business, then perhaps I would have made my 1% contribution to the growth of this Nation. How did you start SailThrough Farms? In 2014 I had just fallen off from a business. Reality was telling on me as a fresh graduate waiting for the NYSC. Since I didn’t want to just sit and wait. I volunteered to work with a friend who at the time was trying to build a Computer Based Test (CBT) Centre for JAMB exams. From my little savings there, I decided to get some DOCs after making a few enquiries about the business. So right in my father’s compound, I built a-2 step cage housing and started. We endured the smells of chicken droppings both at night and day and endured the process of losses incurred at the start up. Well, now we are here! 700 broiler bird capacity strong with expansion plans in view. They tell us that there is hardly any business person that won’t encounter challenges. What are the hardest challenges you encountered so far. At first, it was the necessary skills, finance and land. For skills, we did a lot of research and experimentations. We kept keeping records of both failures and successes and continued to improve on them. We attended seminars that are related to agribusiness, social media and anything else that’s in anywhere relevant to what we are doing at the moment or in the future. For finance, we discovered that there are many Nigerians with money in the bank in search of businesses they can trust. So what we did was to show them our records and the potentials in what we are doing. Also, we made them see how far the money they give us will go in helping better the lives of people in this country (our country). We told them that the growth of this country is our collective responsibility and their money will help directly or indirectly in making this impact. We still face the challenge of land. As you know poultry is a very special business. Suitable sites for our kind of business are scarce and require a lot of logistics. Yes we do have a space we are using now but this is very small considering our expansion plans. You talked about Millionaires in Agro Business. What inspired it? Like I said earlier while stating some reasons why I started out in agribusiness. We needed to change the ways farmers are perceived. We needed to clearly show people the HUGE potentials agriculture/agribusiness has. We wanted these people to be mainly youths. We wanted these people to see how much impact they could bring to Nigeria, Africa and the world at large just by venturing into agribusiness. The only way to reach a larger audience mainly populated by the youths in a quicker way is through the internet. This is why the MIA is an online community. Gain insight garnered from years of experience of failures and successes to start your poultry farm on a strong footing. …and yes the word “Millionaires…” in MIA clearly shows that anyone with the right knowledge and skill can make millions from agriculture/agribusiness. In fact, our vision is to make 10 million Nigerians and 20 million people across Africa millionaires in agribusiness. Related: WHO SAID YOU DON’T HAVE WORK? Within a space of two years, we have empowered over 932 Africans to launch their agro business through this training. If I want to start today, what does it take to succeed in Agribusiness? It takes a lot of things but I will mention a few. You will need knowledge and skill, focus, dedication, perseverance and shamelessness. Of course, you will also need money but if what was earlier mentioned are not there, you will fail even with a Million naira cash in hand. With the success you and some other people in Agro business have recorded; why do people still fail? Beginners always feel they know what to do. Our kind of business is unique. You can’t google and apply everything. You need hands on experience or at least a mentor with great knowledge to walk you through and help you till you properly get your stand. Also, most people fail because they are either too lazy or just so used to the traditional ways of doing things. No innovation. No creativity. Hence, you have stagnancy or failures. What’s your advice to aspiring agroprenur. Be sure this is what you want to do and pursue it with all seriousness. Endure the process and stay with it till you win BIG! How rich has agric made you? But, sir, this may motivate someone whose fear of starting is finance to take a step today. At present we have 700 bird capacity farm and we sell them off every two calendar month. On a normal day we sell between N800 to N1000 when it’s not festive period. However, in festive seasons, we sell for as much as N3000 or N4000. We stocked egusi at recently at N120 and sold at N400 per measurement. When you do the maths, you will know how rich agric has made me. That’s the much I can say. Yes. He is by name Chiemeke Ositadinma. I also have 2 staffs in my farm. Nobody can achieve anything great alone. You will always need help in the pursuit of vision. More importantly, Osita is a very intelligent fellow. He is the kind of partner any one will be lucky to have. How do you ensure harmonious relationship with your partner? I say this because; Osita is in Lagos while I am in Niger state. No one will believe how far we have come in spite of the distance between us. Osita and I go way back. We graduated from the same department in the University of Nigeria, Nsukka. We started out in business together and have both business and friend relationship. In fact right now, I see him as a brother. Osita can clearly see or understand anything while we talk even before I finish explaining. We trust each other with our lives. Sometimes, it takes me a lot of time to give Osita feedback on things; yet he understands. The question of who is telling a lie is not between us. We both share responsibilities and give our best. We don’t keep anything out. We discuss everything. It’s Ok sir. What’s the place of God in your business success? I won’t be where I am today without the help of God. I truly don’t deserve all the favour and blessings I have. My watch words are “honesty” and “sincerity ” in all my dealings with people. It takes a man who fears God to have those two attributes. The first time we built our big farm. That night before the birds arrived the following day. I prayed. I prayed not only for the birds to survive but for the business too. Each time we set goals I lift them up before God. He is at the centre of it all. Is the bae in your life a boost or distraction to you? My bae and soon to be wife have been of great support and motivation to me both personally and to my business. She never liked the smell of chicken droppings or could come close to a live chicken but had to learn to adapt because of me. She understands when I need a time alone and had to think up strategies so she gives me that time. She is the best thing that happened to me. Why should I or any other person interested in Agribusiness with you? Innovation! For instance, most poultry farmers are still used to the conventional methods of making or buying feeds. We found a way to grow the exact chickens as demanded by customers and save over 30% on production cost. We can grow birds to be of more fats or less and more meat. Whatever the customer wants. Our farm combines a lot of concepts and strategies in growing birds to mature at the shortest time possible. These birds are very healthy for consumption too. Our farm is registered as a limited liability by shares. This means it’s not a one man business. We have a lot of investors and many are still asking to join the list. Our farm has found a unique way to maximize the internet in both the delivery of products and services. Our farm is not just one sided. We are into commodity trading, do a lot online and have plans to begin exportation soon. All these make us different and almost financial failure proof. How can someone contact you for more agric and business insight? Editor’s Note: You can inspire the world with your story and give your business massive exposure on our Thursday Business People. Contact us through 08105504664 or brojid@gmail.com if you think you should be featured.